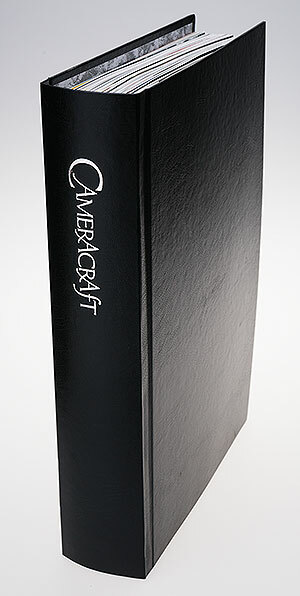 Our Cordex bookcase binder has a spine just over 2 inches, and is hand made in Britain to order. It will hold from 6 (one year) to 9 (maximum) of the new f2 Cameracraft format, or 12 of the original 2012-2015 series of quarterly slimmer magazines. The glossy leatherette paper is wrapped to a stiff cover, with a marbled endpaper lining. A plastic spine mechanism carries 12 strong nylon cords with a spring mechanism concealed, this allows the cord to be extended easily to insert each issue. Our prices include postage. Each binder will store eight issues of the bi-monthly magazine or three years of the original quarterly Cameracraft 2012-2015 series. Is there a way to order this and a subscription in the same time? When we have the binders in stock an option to susbcribe including the binder and Issue 1 will be provided. What is the US price? It’s £14.50 GBP which is about $23 – of which half is postage from the UK, I am afraid. We have tried to find a US manufacturer, so far without success, as it would be good to reduce this price.